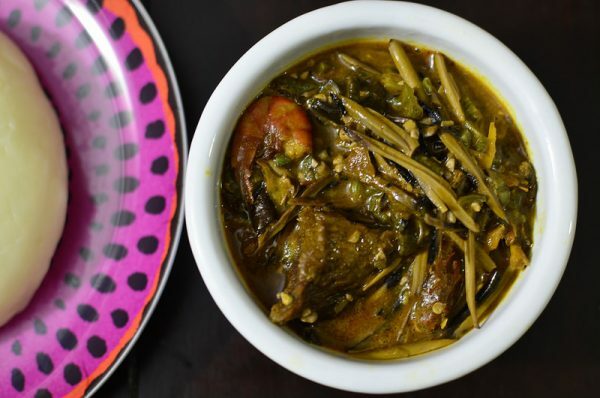 Ofe Ugba, is a native to Imo and Abia states of Nigeria. This recipe is simply Okra Soup cooked with shredded oil beans. You can call it Ofe Ukpaka or Shredded Oil Bean Soup. With most Nigerian recipes, especially Nigerian soups recipes, we go freestyle when it comes to the quantities of ingredients. The quantities of all the ingredients listed above can be adjusted to your taste. In everything you do, let the ugba shine through. I used only fish in preparing this soup, feel free to add meat if you wish. Do not use chicken ooo. Add palm oil to your liking. For the leafy vegetables, add the quantity you like. If you are in Nigeria, use aku ofe (garden eggs leaves), outside Nigeria, use leafy spinach. You can use cayenne pepper (fresh or dry) if you wish. Make sure you Rinse all the vegetables and fish thoroughly with water. Soak the stockfish for a few minutes and clean with a food brush. Soak the dry fish in cool or lukewarm water till soft. Clean, debone and break into pieces. Break the smoked fish into small pieces, debone and rinse. Grind the crayfish and the ogiri okpei with a dry mill. cut the okra fingers into pieces. Slice the onion into small pieces. Cut up the pepper into small pieces. You can grind it if you wish. Cut the garden egg leaves into small pieces. Place the stockfish in a pot, add some water and start cooking. Add water in small amounts and top up when necessary because you want as little water as possible in the pot when done. I use a pressure pot to cook stockfish, softens in no time. When the stock fish is soft, use the cooking spoon to break it into small pieces. Add the dry fish, ugba, crayfish and ogiri okpei, pepper, onions, smoked fish, salt and palm oil. Cover the pot and continue cooking on high heat. Stir often so it does not burn. After about 5 minutes, add the leafy vegetable and okra, stir and add salt if necessary. You want as small quantity of water as possible in the soup before adding the vegetable. I used leafy spinach, watch the video below to see how I pre-prepared the leafy spinach before adding it to the soup. Take the pot off the stove and transfer to another container immediately so that the green vegetables stay green.